While a number of variables influence how medications affect each claimant, clinical evidence suggests that genetics may influence how medication metabolizes in the body. A growing area of study, pharmacogenetics explores how inherited or acquired genetic variations may influence an individual’s response to medication therapy. 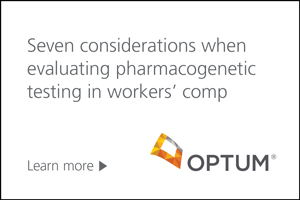 When contemplating whether or not pharmacogenetic testing is appropriate for a workers’ compensation claimant, payers should evaluate the entire therapy regimen and are encouraged to assess seven important considerations. This is a sponsored post from WorkCompWire marketing partner Optum.